See your pond's reflection when you use our Black Pond Dye. 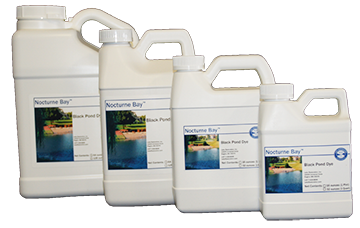 Nocturne Bay™ black pond dye adds a great reflection to lakes, ponds, and large fountains. All dyes are food-grade, which means that they will pose no threat to wildlife (fish or otherwise) if the dyed water is consumed. This means there are no restrictions on swimming, fishing, irrigation, or livestock watering when using a pond dye. Deep color with great coverage for our 2.5 acre pond. It's very helpful in managing filamentous algae along with Mizzen. Great products...will continue to order from Lake Restoration. Love the dark coloring. Gives the impression you are looking at a mirror. Seems to work well over a long period of time. We previously used Aqua Shade, and wanted to try out Nocturne Bay to see if we liked the color better. The coverage was terrible. We used an entire bottle on our very small pond, and the color was brown, at best. Was very disappointed in this product.